← March Madness Gaming at Redbox! 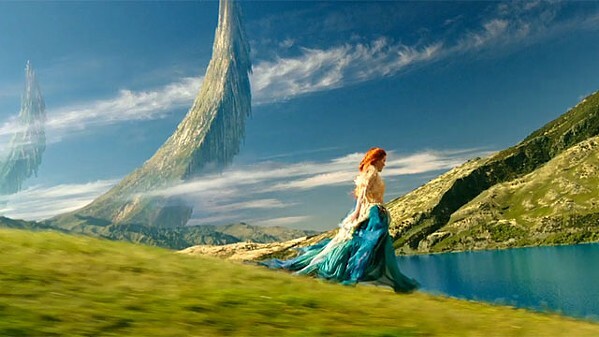 The sci-fi, fantasy adventure A Wrinkle in Time adapts Madeleine L’Engle’s Newberry Award winning 1962 young adult novel. Jennifer Lee (Frozen) and Jeff Stockwell (Bridge to Terabithia) create the screenplay while Ava DuVernay (Selma) becomes the first black woman to direct a live-action film with a budget of over $100 million. The substance of this film seems to contain ideology and intention different from the original author’s perspective and reflects a “philosophy of the time” with modern day quotes and references. This film retains the core “Light” versus “Dark” with the “no options, no problems” mantra where most people willingly submit to the “norm”, which is especially evident in a beach sequence. This one hour and 49-minute adaptation has the advantage of a big budget, special effects technology and a high cast/crew caliber. Storm Reid (12 Years a Slave) portrays Meg Murry, the main protagonist who longs for her missing astrophysicist dad Dr. Alex Murry, portrayed by Chris Pine (Wonder Woman, Star Trek), who seems to have discovered instantaneous travel through space. Meg’s anger, impatience, suspicion (lack of trust) and lack of self-confidence with added elements of self-image permeate the plot, but aren’t fully developed. The other characters must explain these points where the film misses the obvious advantage of showing these points visually. Pine’s role and the related circumstances are noticeably different than the book along with his wife, Dr. Kate Murry who is portrayed by Gugu Mbatha-Raw (Beauty and the Beast, Belle). Meg’s brother, Charles Wallace Murry, portrayed by Deric McCabe, is a prodigy genius and fills out the young character trio with Levi Miller (Pan), who portrays Calvin O’Keefe, Meg’s classmate who is recently impressed with her stand at school against a very mean girl named Veronica, played by Rowan Blanchard (TV’s Girls Meets World). A trio of powerful and transformative beings lead by Mrs. 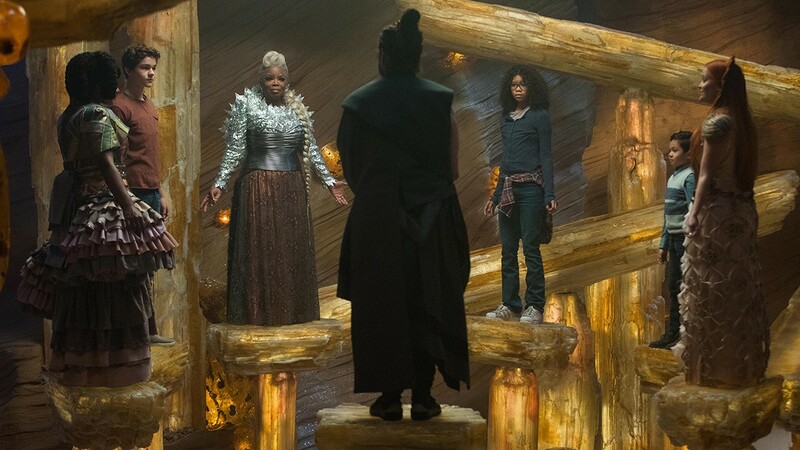 Which, played by Oprah Winfrey, guide the young trio to find Dr. Murry as well as teach the ways of the Light to defeat the Darkness they encounter along the way. The visual effects help with the characters’ “tessering” travels, but the film still tells too much through dialogue to keep the rating at PG. For example, Mrs. Which talks about how the Darkness can elevate evil to the point of war and violence instead of showing any war or violence. Filmmakers also dampen the overall scares with other clever techniques like switching to a nearby character’s reaction when an evil voice embodies a main character during a memorable sequence in a dark hallway where characters are being moved against their will. Audiences do see sequences with mean acts with victims who are mostly bystanders except one man, portrayed by Conrad Roberts (The Mask of Zorro) who appeared in an early sequence. The impressive visual effects also provide the predictable, fun “roller coaster” action sequences mainly involving Mrs. Whatsit on the planet Uriel and the Darkness’ source that lives on Camazotz and described as “many faces with one terrible mind” – the IT. Other key characters include Zach Galifianakis (The LEGO Batman Movie, The Muppets Movie) as The Happy Medium, a clairvoyant who lives in a precarious cave environment where visiting characters must figuratively and literally balance themselves. His impressive compassion and emotional guidance rings true, especially as he helps Meg work through her vulnerabilities and fears. Some extended point-of-view shots from the other characters, especially Meg, would have enhanced the balancing challenges/action. Michael Peña (Ant-Man) plays a key character the young trio encounters on their journey to find Dr. Murry and André Holland is school Principal Jenkins with Yvette Cason and Will McCormack portraying teachers. David Oyelowo even reteams with DuVernay as the voice of a key character reimaged from L’Engle’s book as a vast stringed array. Sequences with low voice volumes (especially during a rescue involving flowers and another climatic sequence on Camazotz) require close listening to catch it all, which is very difficult today in a full theater of people (subtitles on the future home video version will be much better). Daniel MacPherson has a short, but memorable role as Calvin’s Father while other notable roles include Bellamy Young (TV’s Scandal) who plays a female character on Camazotz. The costume design from Paco Delgado, cinematography from Tobias A. Schliessler and production design led by Naomi Shohan all impress. Predictably the original book covers more than this film, but, of course, there is plenty of potential for possible sequels since original book series was five total. 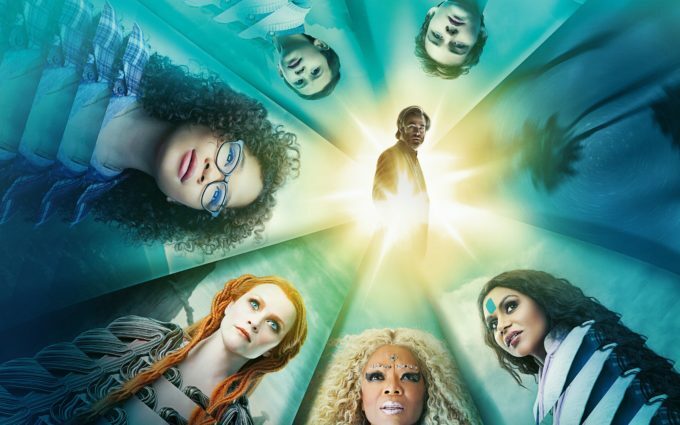 The previous A Wrinkle in Time adaptation was the poorly received 2003 TV movie starring Katie Stuart and Alfre Woodard, which L’Engle disapproved of. L’Engle passed away in 2007. This Walt Disney Pictures’ film has good intentions with young characters challenged to “be a warrior” for the Light (“the Universe”, the greater good), but is notably underdeveloped and became another case of someone imposing personal agenda and misappropriating someone else’s well-known work. instead of staying loyal to the original material. Also showing in Disney Digital 3-D, Real D 3D and IMAX 3D theaters. Be sure to check out co-producer Catherine Hand’s half-century quest to make this film at https://www.npr.org/2018/03/06/589537709/the-wrinkle-in-time-movie-began-as-a-fifth-grader-s-dream. This entry was posted in 2010s Film Reviews, Film Reviews and tagged A Wrinkle in Time, Film, Madeleine L'Engle, Michael Siebenaler, Mike Siebenaler, Tall Writer. Bookmark the permalink.